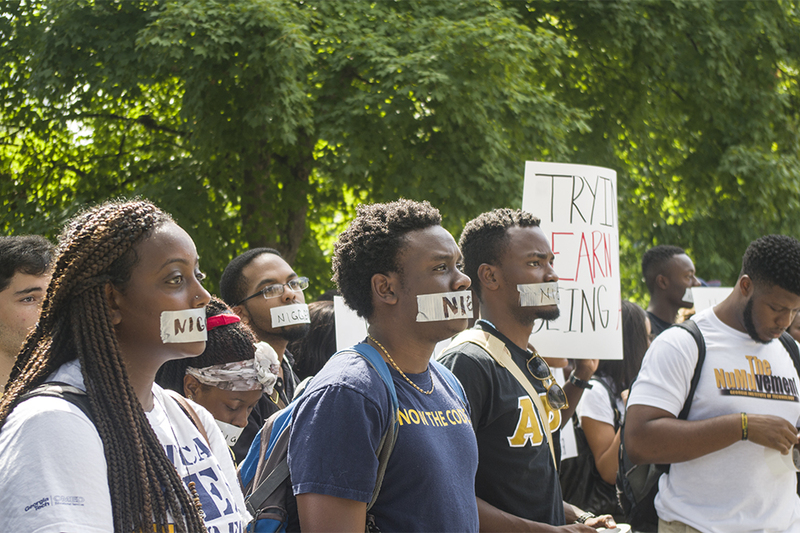 Following an alleged incident of racial harassment of a black female Tech student by brothers of the Phi Delta Theta, protests were staged on the morning of Thursday, Aug. 20 by a group of students, who were primarily involved in black student organizations. According to members of the protest, including Nelson Raphael, the Black Leadership Conference Co-Chair of the African American Student Union as well as a second-year EE, the harassment incident allegedly occurred on at approximately 6:45 p.m. on Aug. 11. The student was walking along Fowler Street towards her car, when she was allegedly verbally assaulted by brothers of the Phi Delta Theta fraternity. The brothers allegedly involved in the harassment were reportedly three white males who were hanging out of a window of the Phi Delta Theta fraternity house. The victim reportedly then quickly proceeded to her car and drove away from the area. Prior to the demonstration on Thursday, students met in the Student Center Theatre. A few minutes after 11:00 a.m., Raphael addressed the gathered crowd and announced a number of ground rules for the protest. The gathered students then collected certain supplies from the front of the theatre, including posters and duct tape. The posters’ messages were mainly those expressing sentiments that inequality persisted on Tech’s campus, while the duct tape was utilized by students to cover their mouths. Some students also wrote racial slurs on the duct tape before applying it in this way. “If you’re not familiar, we will be writing the obscenity on our duct tape, and we will place them on our mouths to show the power of the word when it takes our own speech away from us to defend ourselves,” said Raphael. Raphael then instructed all those present to remain on the sidewalk and not to enter the fraternity’s property. He emphasized that it was important that the group remained civil, orderly and within their rights. The students then proceeded towards the fraternity by walking down Skiles, then turning left before passing the CULC. During the walk, some students commented on the reasons why they were taking part in the demonstration. Another student, who wished to remain anonymous, said that the use of derogatory terms towards groups on campus needs more attention than it is currently getting. Upon reaching the sidewalk area adjacent to the fraternity, the group of protestors assembled themselves largely on the opposite side of the street. The posters were prominently displayed by the students present, and most assumed a position involving staring upward towards the fraternity house. Over the duration of the hour, there was little to no speaking done by the protestors. Few of those who passed by the demonstration ignored what was happening, and some slowed down to take the scene in. Brothers of the fraternities adjacent to Phi Delta Theta, which are Chi Phi and Sigma Nu, walked outside during the hour that the demonstration took place. Their outlook on the situation was unclear. Not a single individual emerged from the Phi Delta Theta house during the time that the protestors were present. At a few minutes before noon, Raphael announced that the group would now proceed back to the Student Center. He then spoke with the Technique about motivators for the demonstration as well as events leading up to it. In a statement released, Matt Edwards, the Alumni Association President of the Georgia Delta Chapter of Phi Delta Theta, stated that the chapter at Tech has fully cooperated with Tech administration who are investigating the incident. Raphael noted that the goals of the demonstration did not included the alienation of the administration; prior to Thursday, he as well as four other students met with members of Tech administration to ensure the demonstration would be legal and would not impede activity in the area. Raphael noted that, while the demonstration was a success, the problem still exists. Members of the protest, including Raphael, affirmed that they understand Tech administration supported the demonstration. A previous version of this article stated that the fraternities adjacent to Phi Delta Theta are Chi Pi and Zeta Beta Tau. The adjacent fraternities are Chi Phi and Sigma Nu.